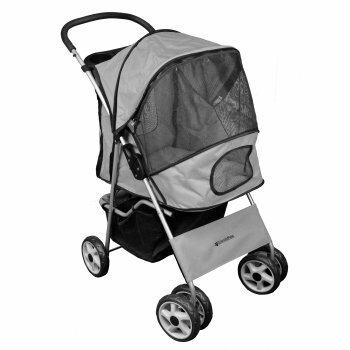 This is a wonderful, fold-flat 4 Large Wheel platinum greyPet Stroller with a heavy-duty yet lightweight steel frame. The stroller is manufactured with high quality water resistant 600 Denier Polyester Fabric and is of the latest design straight from the United States of America. The superior four-wheel mobility keeps the ride safe and smooth without stressing your dog out whatsoever. Furthermore, the four wheels will not bog down in muddy grounds and therefore makes this pet stroller ideal for any UK weather - the wheels are extra large in size rather than the standard size of 5" sold by other retailers. The diameter of the wheels is approximately 7 inches. The rear wheels include locking brakes to ensure your pet stays safe when you decide to stop. Comes complete with cup holder. A Dog Pet Stroller is definitely the most stylish and practical way of getting your pet and your dog accessories out and about on the dog show circuit as well as for long enjoyable walks. Save your dogs joints and stop it from overheating in the summer.